Get behind the scenes at this important sports and concert venue. Want to see the areas of Madison Square Garden that are only accessible to those who can afford the high-priced private suites? The All Access Tour gives visitors a behind-the-scenes look at Madison Square Garden, including a peek into team locker rooms, suites and the VIP only restaurant. It's interesting to visit the space when there are so few people in it (and how often are you likely to get to see a game from one of those high-end suites?) but to see the Garden in action, you might prefer to attend an event. It may seem puzzling that Madison Square Garden is located on 8th Avenue and 31st Street, no where near Madison Avenue or Madison Square Park, but the current Madison Square Garden is actually the fourth building to have that name. The first building -- Madison Square Garden I opened on Memorial Day in 1879 and was located between Fifth and Madison Avenues from 26th to 27th Streets. Your tour guide will lead you around Madison Square Garden, sharing the Garden's history and most famous events, as well as showing you the VIP-only Club Bar and Grill, private suites and team locker rooms. 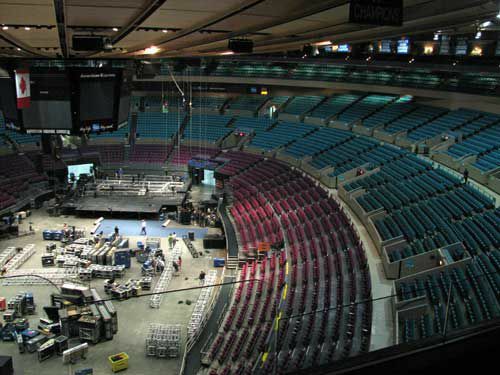 You will also see the Theater, which is a smaller performance venue at The Garden. It was a good reminder that there are essentially two different venues at this location, so not every show at MSG has to be an arena-sized event. While the history of Madison Square Garden is notable, the building itself is not beautiful, and the tour feels a lot like a sales pitch for booking private events or renting the private suites. The Knicks/Liberty and the New York Rangers locker rooms are included on the tour, but they are only used for games (the teams practice elsewhere), so there is very little memorabilia or character in the space. While the avid sports fan may enjoy this tour, to experience the real energy of Madison Square Garden, you'll be better off buying tickets to see an actual event at the arena or theater. Most kids would be very bored on this tour. The tour lasts approximately an hour and is offered from 9:30 a.m. - 3 p.m. 7 days a week. Purchase same day tickets at the MSG Tour Shop to the right of the box office. The tour includes some stairs, but they can accommodate guests needing elevators. Admission included with the New York Pass. Here's Your Chance To Meet A Real Rockette!